Alright, it’s not the one on Facebook. My backyard is proudly named Farmville thanks for my lovely wife (and the Big Boss) for handling it very well this year. Here are some nice pictures from the ville. Lavenders and rosemary. 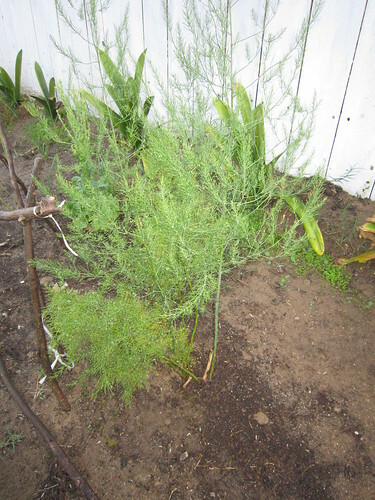 I covered the plowed land with weed guards, but actually it blocked the dirts better (it’s quite windy in my backyard). 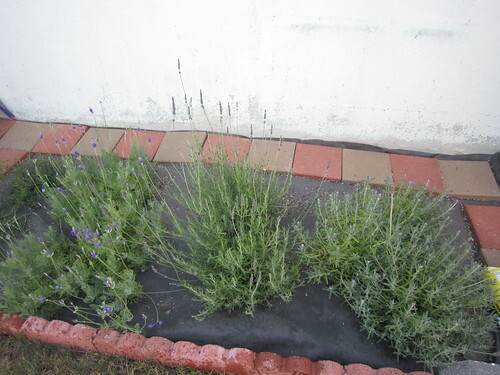 Lavenders and rosemary were bought from my wife’s student. There are four different kinds of lavenders in the picture, and I don’t know what they are. I feel that I’m knowledgeable enough to tell others they are different lavenders and they can’t be eaten. Oh yeah strawberries. 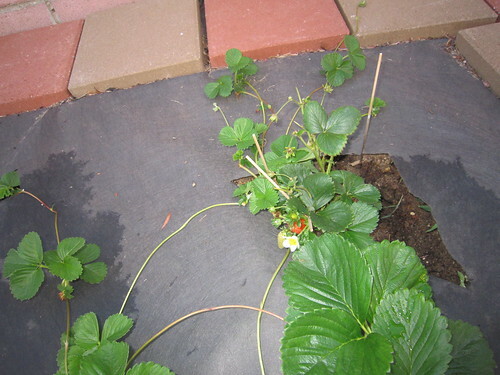 It used to produce two or more berries at the time when we bought it, but now it produces less than two per month. 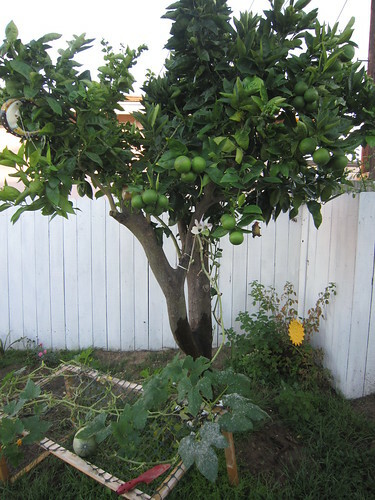 The orange tree and hopefully sweet oranges. 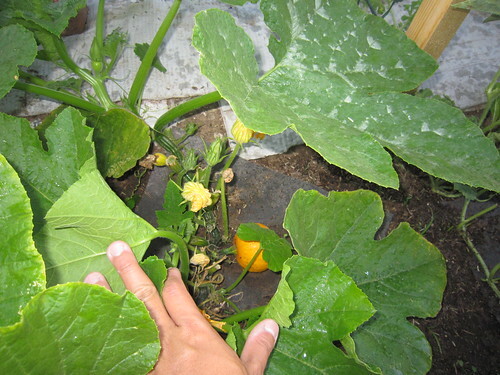 There are some squashes underneath it and we really don’t know what kind of squash it is. The squashes are good for making desserts. We hang the squash on home-made racks so that it won’t be flooded when we water it. The one on the bottom right is a sick raspberry. We knew it’s caused by bugs but we don’t want to use pesticides, and we crossed our fingers to hope it survives by itself. 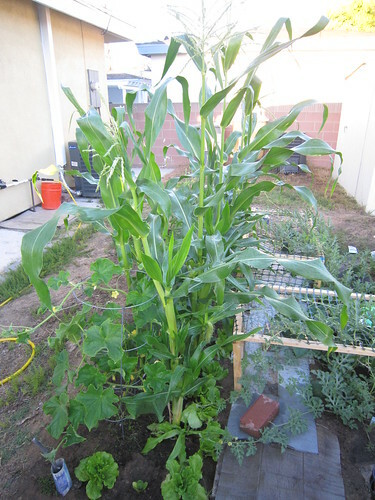 Corns, zucchini, and Japanese yam. Japanese yams are there by surprise, we didn’t plant it 🙂 Personally I like Taiwanese yam better, because the leaves are eatable (Japanese yam leaves taste bitter). 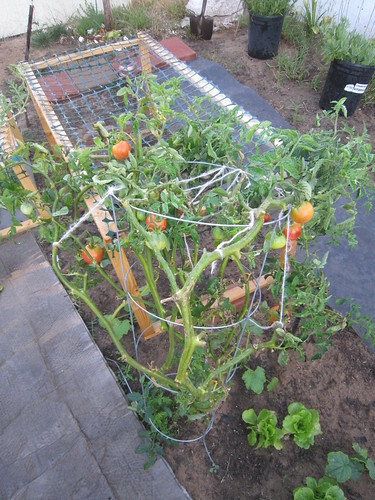 There’s a collapsed tomato because the cage is not strong enough to stand against the wind in my backyard. There’s an apricot tree on the very far end and we hope it gives us some nice apricots next spring. 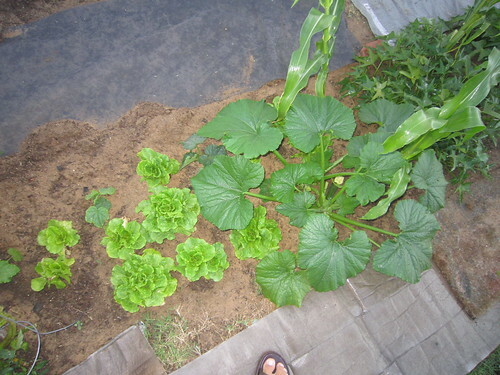 Close up of the zucchini, lettuce on its side. The brave surviving tomato after three collapses in the row. Calabash, Japanese yam and green onion. 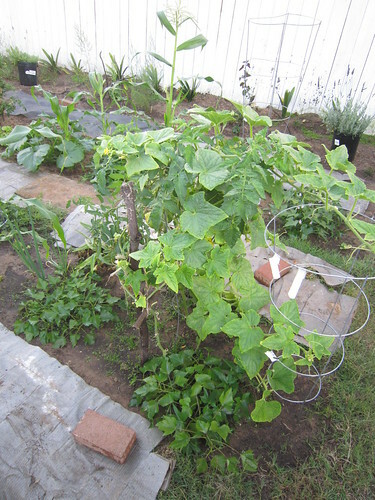 Why do we plant calabash? That’s a good question. My wife uses dried calabash for art projects in Chinese school. BTW I was asked frequently about how to plant green onions. It’s simple. Buy green onions from supermarket, cut the root off, dig a small hole in the ground, put the root in, and water it everyday. A month later you’ll have green onions on your table. 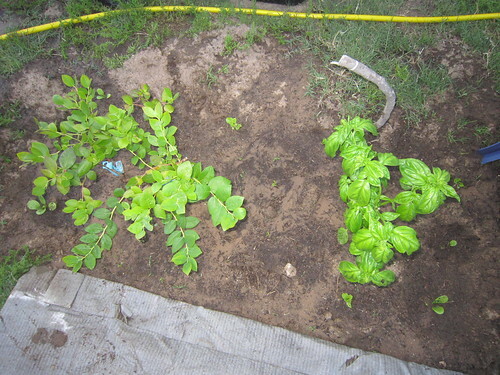 Blueberry on the left and sweet basil on the right. 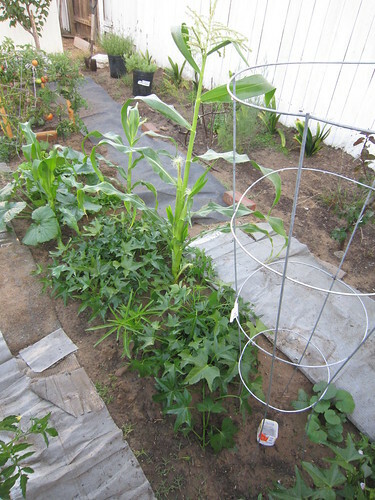 Corns, butternut squash, some green veggies (I forgot it’s lettuce or Taiwanese bok choy). The one on the right hand side is watermelon. Watermelon? Please don’t doubt, this is it. Well, two baby watermelons. 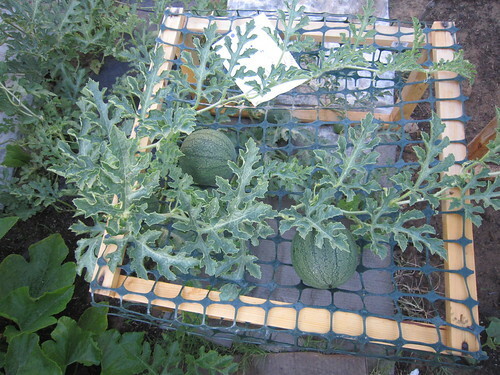 I also grow some small pumpkins underneath watermelon racks. They will be useful in Halloween. Ladies and gentlemen, this is passion fruit. 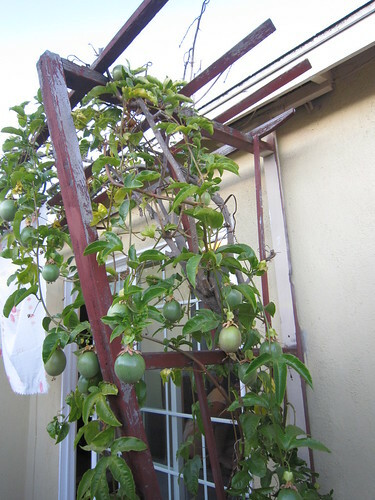 Matured passion fruits are purple and fall off the vine themselves. Inside the passion fruits are plenty black seeds wrapped in golden pulps that are similar to guava. Passion fruits grow in vines! For all of you heavy Farmville players, passion fruit is not a tree.